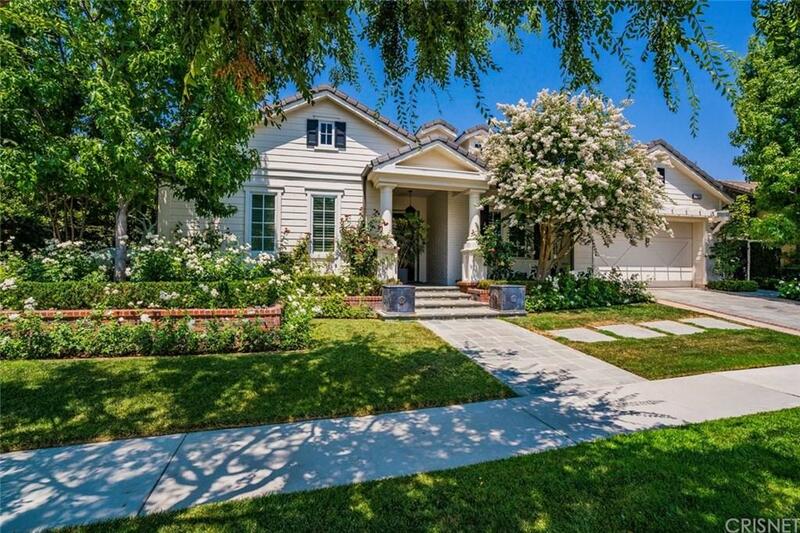 Fabulous single story located within the exclusive guard gated Oaks of Calabasas. This beautiful Arbors Plan 1 is located on a quiet cul-de-sac, Features include 12 foot ceilings, custom cabinetry in the library. and 4 bedrooms and 3.5 bathrooms.The chefs kitchen offers a large center island with stainless steel commercial appliances, beautiful designer finishes, and breakfast nook which seamlessly flow into the expansive family room. The newly renovated private master suite is bathed in natural light with floor to ceiling windows.the spa like master bath has white marble floors and counters, a free standing tub and separate shower, and fantastic walk-in closet. The resort like grounds are highlighted by a swimming pool, several entertaining enclaves including a covered area with outdoor fireplace, BBQ, built in seating area with fire pit and a romantic side yard for additional dining. Upgrades through out.